an elegant unit testing framework for C with support for mock objects. It only requires the standard C library, works on a range of computing platforms (including embedded) and with different compilers. The goal of this project is to provide a powerful testing framework for C, on different platforms and operating systems, which only requires the standard C library. This makes it possible that cmocka works on many of embedded platforms. Test fixtures are setup and teardown functions that can be shared across multiple test cases to provide common functions that prepare the test environment and destroy it afterwards. 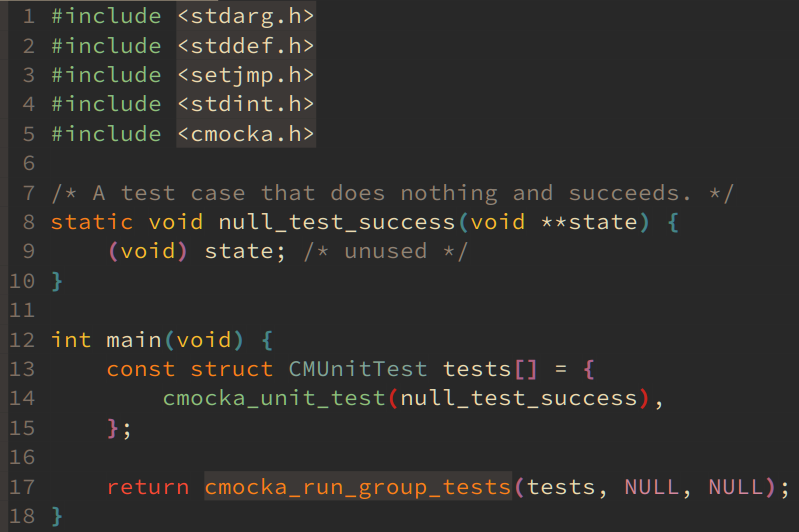 cmocka is able to recover the test state if there are exceptions like a segfault. cmocka doesn't use fork() for exception handling in test cases. cmocka has nightly builds to test on several platforms and with different compilers to ensure it works correctly. If you want to get it working on your platform you can add a nightly build and we will make sure not to break your platform or compiler. Testing of memory leaks, buffer overflows and underflows. We offer functions during test which are able to detect some sort of memory allocation issues without running tools like valgrind. cmocka is a fork and the successor for cmockery. We offer the installation of a cmockery header so that your tests written for cmockery are still working till you migrate to cmocka. cmocka works well on Linux, BSD, Solaris, Windows and embedded platforms. It is known to be working with GCC, LLVM, MSVC, MinGW and many more. cmocka is an open source project, feel free to use it, share with love, if you want to collaborate just contact us. Version 1.1.5 has been released with a set of new assert functions and a function to skip tests. We released version 1.1.3 to fix some smaller issues of the last release. Samba - Samba is the standard Windows interoperability suite of programs for Linux and Unix. You can find the mailinglist archive here.